Haas backs new title sponsor Rich Energy's long-term target of beating Red Bull in F1. Haas has moved to defend the ambitious target laid out by its new Formula 1 backers Rich Energy of beating Red Bull. Rich Energy CEO William Storey set the bold target of challenging Red Bull “both on and off the track” during a team launch event in London on Thursday, in which Haas unveiled a new black-and-gold livery for 2019 in a move influenced by its new sponsorship deal with the British energy drinks company. Haas team principal Gunther Steiner backed Rich Energy’s aim, adding “you never achieve anything” without setting targets while stressing that the American squad would “try hard” to achieve the goal. When asked if he sensed an opportunity to capitalise on Red Bull’s gamble to switch to Honda engines, Steiner replied: “It is difficult to say because Honda will get better. “They got better every year, and they’re going to get better again. For sure Red Bull will help them to get better in my opinion, because as you know, they are a good team. “They’re always there or thereabouts. If they can steer them in the right direction, but for sure, Honda had a little bit of reliability issues last year, so let’s see what’s coming this year. “I cannot look into the future to say how good they are, how bad they are. I don’t wish anybody bad, but if we are better, I’m happy. 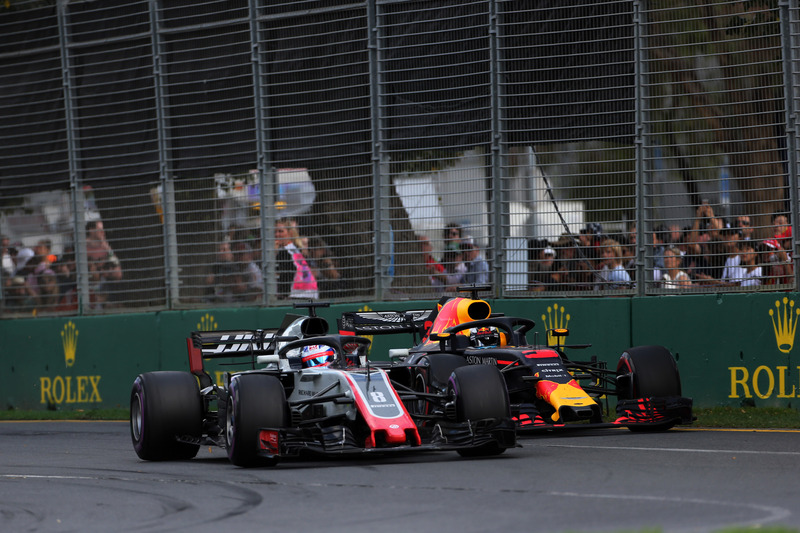 Haas took its best-ever finish in F1 in 2018 by claiming fifth place in the constructors' championship, behind only Mercedes, Ferrari, Red Bull and Renault. Driver Kevin Magnussen echoed Steiner’s comments and insisted there is no harm in setting out big aims for the future. “I think it’s great to have big ambition,” Magnussen said. “You hear William say that he wants to take on Red Bull and he started a company that is going to be in direct competition with Red Bull outside of Formula 1, so you need to have this kind of ambition to succeed. So there’s nothing wrong with that at all. “I doubt that it will be this year, but in the future no-one knows what the future holds. “There’s going to be regulation changes and maybe budget caps, who knows what can happen? So you can’t say what is possible at the moment.